It’s a fact that children with special needs can bring their share of love and challenge to any family. With autism rates rising around the country, this has become an issue that is on the mind of anyone who is planning to have children. For families who already have children with any of the many special needs issues, financial concerns often take a back seat to many of the practical issues of daily life. Education, healthcare, the cares and emergencies of daily life, all of these can leave the special needs parents with little extra time to care for the finer points of a family financial plan. Nonetheless, this leaves many such families financially vulnerable. With so many resources devoted to the care of a challenged or disabled son or daughter, it is not at all uncommon for families like this to have finances which are all out of whack. This can add stress to an already stressful environment. Fortunately, there are techniques and services which provide financial aide and counsel to parents of special needs children. We’ll talk about some of them here. First, find a financial advisor who specializes in families with special needs. If you aren’t able to find one in your area, seek out an advisor who is willing to work with you, doing research and seeking out relevant programs, in order to both stretch your family’s finances as far as they will go, and to prepare your children for their long term future. A financial advisor is no replacement for doing your own diligent research. This issue is a complex one, but with hard work and a qualified team, you should be able to learn everything that you need to know. Next, pick out life insurance that meets the needs of your family’s situation. Most families will have to decide between term life and whole life (or “permanent”) life insurance. Your children will likely outlive you and will need provision for the rest of their lives. In most cases, whole life insurance can be structured to be more affordable than term life, but this should be discussed with you insurance company. It isn’t in the purview of a simple article like this to handle the complex details of special needs financial planning, but I do want to clue you in to some of the topics you should research and go over with your financial planner. Beneficiary designations, Special Needs Trusts, Estate Plans, Wills, and 529 Plans will all likely find their place in the life of your child or children, and all must be clearly understood on your part. Finally, make a plan and communicate it to your family. Choose trusted family or friends to act as executors and guardians if necessary. Very often, these will not be the same people. Finally, see to it that your plan for the future is written down and kept in a safe place where it can be easily referenced if you should pass away unexpectedly. None of these are happy or fun considerations, but it’s the reality of life of families with special needs children. By getting these necessary steps out of the way, you can eliminate stress and worry, leaving you time to simply be a parent to the children you love. Definitely something that those with special needs need to think about deeper … great post! This kind of situation is definitely in need of insurance and financial adviser. Imagine all those expenses to meet needs of children with special needs. Some great points here. 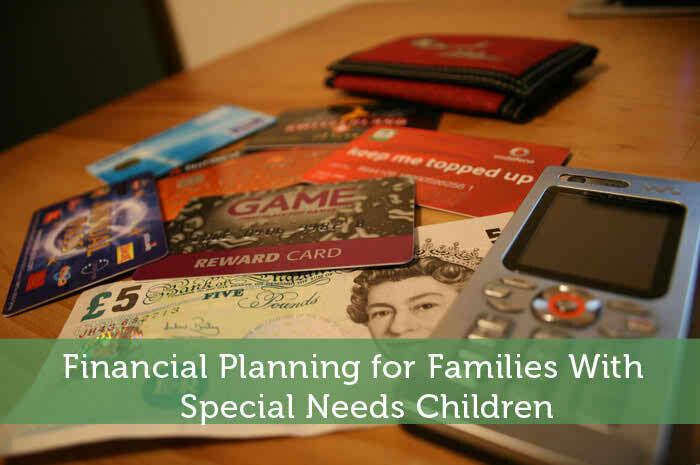 If you have a child with special needs, your financial planning definitely has to change much like a lot of your life. Thanks for sharing some of these points! It’s always wise to consult with not only your family, but also with a special needs financial planning attorney, and you should always do it sooner than later. You never know what circumstances you could find yourself in within a few years, and they can guide you toward the best financial plan for your child to secure their future.